This little known natural wonder is located 40 kilometres east of Quebec City, smack in the middle of the regions of Beaupre Coast and Charlevoix. "Smile!" my husband shouted over the roar of the rushing water as I clung desperately to the railing of the steel bridge with both hands. He was about to take a picture of me on the McNicoll suspension bridge, which hangs 180 feet above the majestic Sainte-Anne Canyon in the province of Quebec, Canada. But being deathly afraid of heights, I had visions of it collapsing at any moment, � la Indiana Jones. The fact that the bridge was swinging side-to-side didn't help either. As terrifying as that was to me, it was well worth the night terrors to see the canyon in all its splendour and the powerful waterfall that carved it into the 900 million year old rock of the Canadian Shield. This little known natural wonder is located 40 kilometres east of Quebec City, smack in the middle of the regions of Beaupré Coast and Charlevoix. It was exactly the rugged beauty of the area that convinced Jean-Marie McNicoll to develop the locale as a tourist area after seeing it in the summer of 1965. McNicoll was on a camping trip when he was taken to the canyon by a man who had been a logger on the waterway. There were no roads into the area so the two of them had to make their way through the dense, untamed woods; but it turned out to be a walk well worth it, for McNicoll. He was so impressed by the pristine beauty he saw that he persuaded his brother, Laurent, to come to the area that same week. At that point the idea of developing a tourist zone took root. Their objective: allow the general public access to the area while respecting the natural setting of the canyon. The two brothers, armed with nothing more than enthusiasm, set about making their dream happen but it would be a long eight years before the first tourist would ever set foot in Sainte-Anne. First they needed to acquire the land around the area. It took two years to lease the shores of the river from Hydro-Québec and to buy the wooded lots bordering the falls and canyon. Then came the immense job of clearing land and constructing a road to the site. 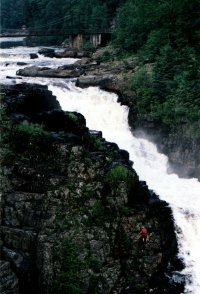 Finally, in July of 1974, the Sainte-Anne Canyon officially opened to the public. Initially, visitors would get to the locale by trekking over a kilometre through the woods. Since then, a shuttle bus has been added as well as a restaurant, a picnic area, gift shop and outdoor theatre. Three bridges and various lookout platforms, with interpretive displays, have also been constructed allowing for spectacular views of the canyon. Tours begin at Mestachibo Bridge, located at the head of the falls. It was the first bridge to be built, one year after Sainte-Anne opened to the public. After crossing the bridge, visitors can sit down and enjoy some sun on the Rocky Flats, that consist of rock composed of granite gneiss polished by Springtime water wells. On sunny afternoons Mother Nature sometimes presents a radiant rainbow crossing over the canyon. This natural phenomenon is the result of the decomposition of solar light by water drops from the rising river vapor. 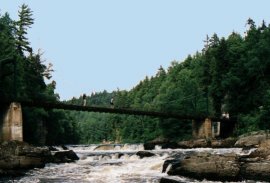 Continuing the tour down the canyon brings you to the McNicoll suspension bridge, which the more faint of heart may want to by-pass, but walking down to the bottom of the gorge, will bring you to the Laurent Bridge. Built in 1995, it offers a spectacular view of the whole canyon and allows everyone to appreciate the 270 foot falls in all of its magnificent glory. The shot of the mountain climber by the falls shows its scale. The Canyon Sainte Anne website is available in English and French.